Nurses around the world can connect and communicate with each other in more ways than ever before by using social media. Social media is well suited for nursing use because it is a tool for disseminating evidence-based information to colleagues and the general public, and for advocating for the profession. Of course, caution is needed. Nurses must use social media in a way that is consistent with professional codes of ethics and standards to avoid legal pitfalls. We refer readers to our list of references for articles and resources that address these issues. In this article, we want to focus on the positive side of social media by sharing our experience with the Day in the Life project, a Twitter-based social media campaign that nurses at The Ottawa Hospital use to share insights into the nursing profession. Sharing is done in a live tweet format: users post a series of tweets to chronicle a specific event as it happens. Tweets are connected using a hashtag (a word or phrase preceded by the # symbol). TOH Nurses, the umbrella name for the nursing social media accounts at The Ottawa Hospital, uses the hashtag #nurselive for live tweets. Each tweet discusses the nurse’s role as the live events unfold, so the project stands as an instantaneous record of what happens, minute by minute, in the day in the life of a nurse. 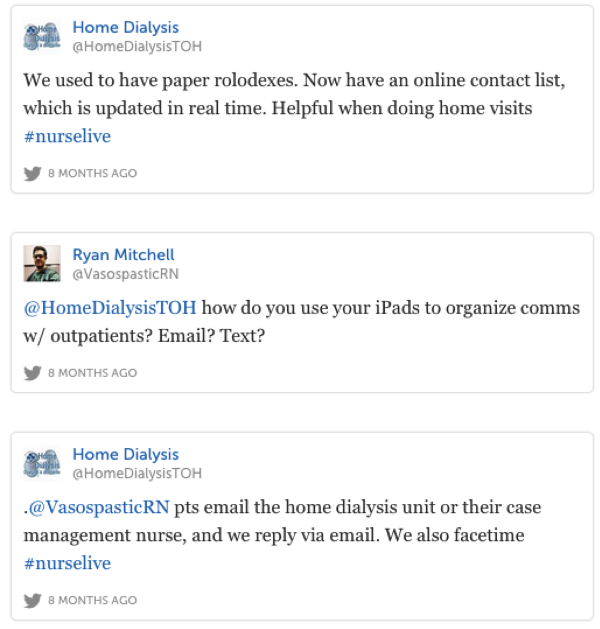 Live tweets have focused on medical and surgical inpatient units, the home dialysis unit, nursing orientation, prevalence assessments, administrative nursing, and nurse educators. Every care is taken so that no confidential information is included in the communications. The Day in the Life project has several benefits, including raising awareness about nursing, and advocating for nurses. For example, there are many negative images of nursing in the media, from highly sexualized portrayals of nurses to depictions of healthcare systems where nurses are invisible. A live tweet represents a real day in the work lives of nurses, and chronicles their critical thinking, compassion, and nursing skills. Day in the Life also provides the opportunity to role model appropriate behavior to colleagues, and the public. Live tweets can facilitate succession planning. For example, a nurse who is interested in becoming a nurse educator can read a nurse educator’s live tweet to learn more about the role. There are benefits to having nurses live tweet their day. Live tweets are interesting when they have diverse presenters who provide first-person accounts of their roles and experiences. 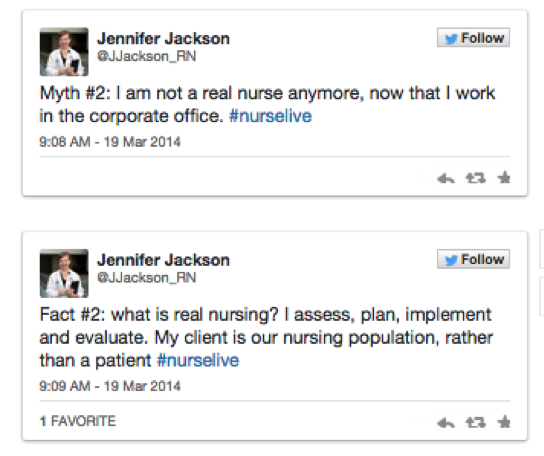 Nurses who host their own live tweets participate in skill development with a facilitator in advance, and become engaged by using social media as a professional tool to improve their practice. A live tweet enables nurses to use social media to share information about their roles and innovations in clinical practice. The stages of development for A Day in the Life mirror those used in the nursing process: assessment, planning, implementation, and evaluation. During assessment, interest in participating in a live tweet is expressed by a clinical nurse or nursing group. The facilitator meets with key stakeholders to answer questions, establish goals for the live tweet, and review guidelines that have been developed to guide participation. These guidelines include the basics of Twitter, such as hashtags, and also address the goals, structure, and content for live tweet days. The key stakeholders meet a week or two in advance to brainstorm project themes and practice methods for using Twitter. They also review principles of confidentiality and privacy, and establish safeguards to protect patients while tweeting. While the aim of the day is to share information in a spontaneous manner, it is helpful to establish some topics for discussion. For instance, in the live tweet of nurse educator days, the educators discussed common challenges in their roles, and why they became nurse educators. Planning includes promoting the live tweets, which is done in a variety of ways. An obvious choice was Twitter, sharing information with nursing colleagues by notifying individuals who might be interested. Common nursing hashtags were also used to tag tweets (such as #nursing), and the hashtag #nurselive was registered with Symplur, a healthcare hashtag database. Other social media avenues, such as Facebook, are used to promote live tweets. Emails are sent to key stakeholders in the organization. The TOH Nurses social media accounts are all public, so nurses are encouraged to follow along even if they do not have a personal Twitter account. The implementation process for A Day in the Life follows a model similar to one used to introduce a new product into a clinical setting: educational materials are given in advance, inservices take place, and support is provided throughout the implementation process. Either a facilitator is present to tweet for a day or nurses write their own tweets. When a clinical area is being profiled, such as an inpatient unit, a facilitator is on the unit for the day; this helps reduce disruptions to patient care. Live tweet days take place over one shift, for 8 or 12 hours, depending on the clinical setting. The target is at least one tweet per hour during this time, although there are many more tweets when a facilitator is present. Other team members are encouraged to tweet from home or during scheduled breaks. The facilitator also has an opportunity to ask questions of the clinical nurses, and can share information that may have otherwise been taken for granted. A challenge is that a facilitator who is tweeting may be new in the clinical environment, and some nurses may perceive this presence as intrusive or unnecessary. This challenge is addressed by having the facilitator meet with nurses in advance of the live tweet day. The facilitator asks clinical nurses about their roles and activities when they are not providing direct patient care. 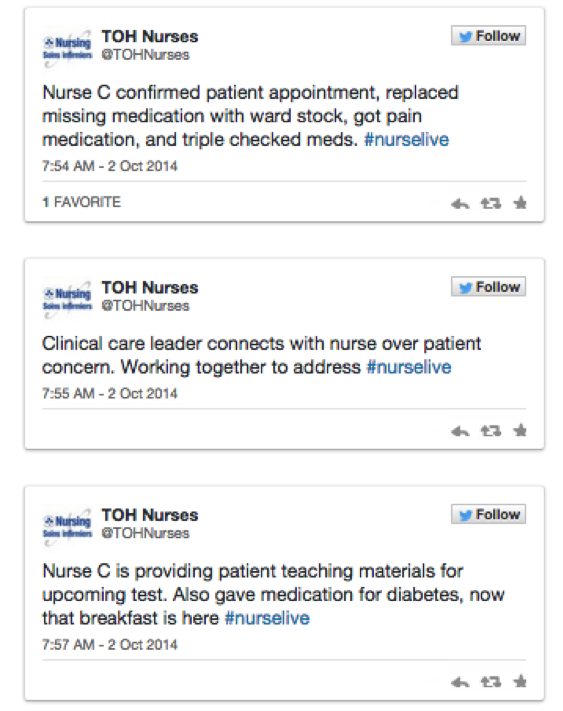 This effort minimizes the impact of the live tweet on nursing care workflow. Overall, the program is well received by nurses, who are glad to have an opportunity to demonstrate the expertise and impact of clinical nurses. It is worth mentioning how the project can increase the visibility of corporate nurses in clinical settings, as the corporate nurse acts as facilitator. Increased visibility and availability of corporate nurses can promote discussions, allow valuable face-time, and open a dialogue toward joint efforts that address challenges in a clinical setting. This nurse-centered perspective decreases the likelihood of violating patient confidentiality. Whenever possible, events that are happening during the live tweet are tied to professional issues, such as career development, patient safety, and critical thinking. No photos of patients are included, and all staff give verbal consent before being photographed, per The Ottawa Hospital policy. At the end of the day, the nurse concludes by signing off, and thanking key stakeholders. Evaluation takes place continuously throughout the live tweet, and at the end of the day. This review helps nurses appraise content and response: What topics have been addressed? Who is responding to tweets? What issues received the most feedback? The content is constantly adjusted to reflect what is happening in the clinical setting, and the responses received from participants. Answering questions is a priority; soliciting feedback from stakeholders in the clinical setting is secondary, but advantageous. Lasting posts are created by aggregating the tweets. By using the program Storify, tweets are recorded and made into a themed transcript; this allows the content to be shared with readers in its entirety. 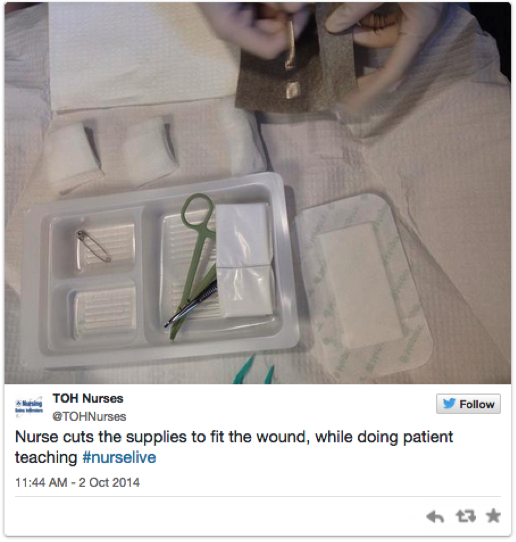 Nurses do not need to have a Twitter or Storify account to view the content. The link can be circulated to share the output of the project and engage stakeholders. The #nurselive transcripts can be read in full at https://storify.com/tohnurses. 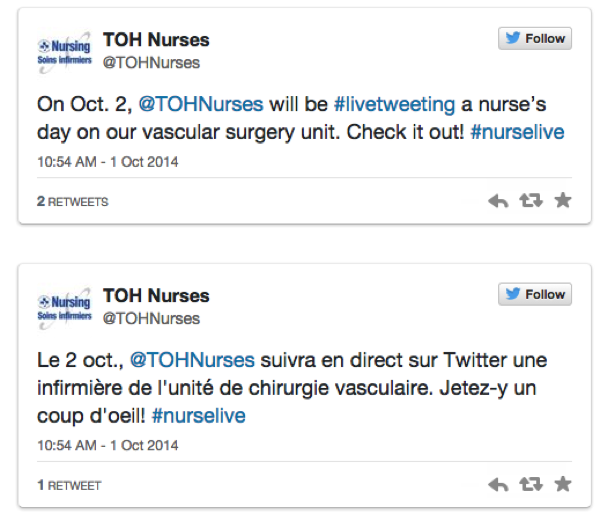 Technical challenges can occur during a live tweet, which can intimidate some nurses who are new to the process. These challenges may include creating a Twitter account, ensuring stable and secure wi-fi access, and any glitches that can occur with the hospital devices or Twitter itself. Time spent tweeting may detract from other responsibilities, or a live tweet may need to be paused in a crisis situation. When the live tweet is resumed, a nurse can begin with comments on a crisis debriefing process, or include follow-up with nurses at the end of the day. 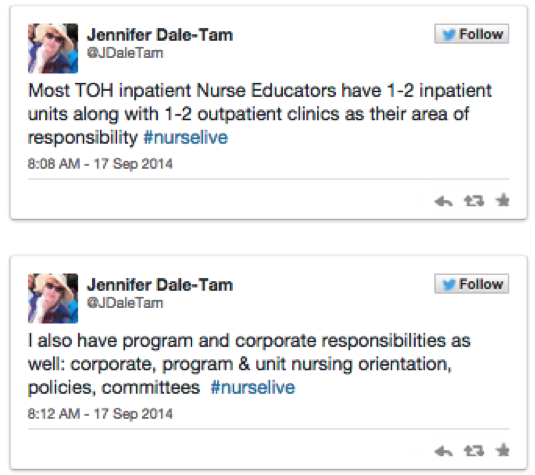 Nurses who are tweeting about their own day should allocate time for the task during one shift. Fraser RD. The Nurse’s Social Media Advantage: How Making Connections and Sharing Ideas Can Enhance Your Nursing Practice. Indianapolis, Ind: Sigma Theta Tau International; 2011. Ferguson C. It’s time for the nursing profession to leverage social media. J Adv Nurs. 2013;69(4):745-7.
health for individual and professional use. OJIN: The Online Journal of Issues in Nursing. 2014. Jennifer Jackson is the advisor in the Centre for Nursing Excellence at The Ottawa Hospital, Ottawa, Ontario, Canada. Ryan Mitchell is a clinical nurse in neurosurgery at Queen Elizabeth II Health Sciences Centre, Halifax, Nova Scotia, Canada.